Be the first to share your favorite memory, photo or story of Jeremiah. This memorial page is dedicated for family, friends and future generations to celebrate the life of their loved one. 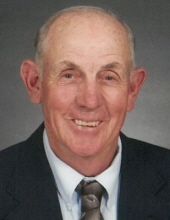 Jeremiah “Jerry” Cantrel Bleckley, 79, of Bassett, VA lived a full and loving life. He entered into the presence of God after a short battle with cancer on Sunday, October 28, 2018 at Salem VA Medical Center. He was born on July 24, 1939 in Clayton, GA to the late George Bleckley and Beulah S. Bleckley. In addition to his parents, he is preceded in death by his siblings, Sallie B. Beatty, Lutz Bleckley, and Carlene B. Rogers. Mr. Bleckley retired from E.I. DuPont and served in the United States Army in Korea. He was an active member of Fork Mountain United Methodist Church, Snow Creek Masonic Lodge #90 and Penhook VFW Post #10840. He is survived by his wife, Nancy Bleckley of the residence; sons, Todd Bleckley and wife Nena of Mooresville, NC, and Tony Bleckley and wife Cheryl of Blountville, TN; sisters, Lena B. Deal of North Augusta, SC, and Cleo B. Fountain of Rabun Gap, GA; brothers, Grice Bleckley of Fort Myers, FL, Doug Bleckley of Clayton, GA, and Nathan Bleckley of Clayton, GA. Jerry is also survived by his sister at heart, Ethel M. Nunn of Bassett, VA and his grandchildren, Isaac, Isaiah, Ameris, Caleb and Nathan Bleckley. A visitation will be held on Tuesday, October 30, 2018 from 5:30 to 7:30 p.m. at Norris Funeral Services, Martinsville Chapel. Funeral will be held on Wednesday, October 31, 2018 at 11:00 a.m. at Fork Mountain United Methodist Church in Bassett, VA with Rev. David Williams officiating. Burial will follow the service at Henry Memorial Park with Military and Masonic Rites. In lieu of flowers, memorials may be made to the Sarcoma Foundation of America, P.O. Box 98160, Washington, DC 20090-8160. Norris Funeral Services, Inc. and Crematory of Martinsville, VA is serving the Bleckley family. Online condolences can be made at www.norrisfuneral.com. To send flowers or a remembrance gift to the family of Jeremiah "Jerry" Cantrel Bleckley, please visit our Tribute Store. "Email Address" would like to share the life celebration of Jeremiah "Jerry" Cantrel Bleckley. Click on the "link" to go to share a favorite memory or leave a condolence message for the family.